Time for me to stop pretending that Mid Wales has no mountains. 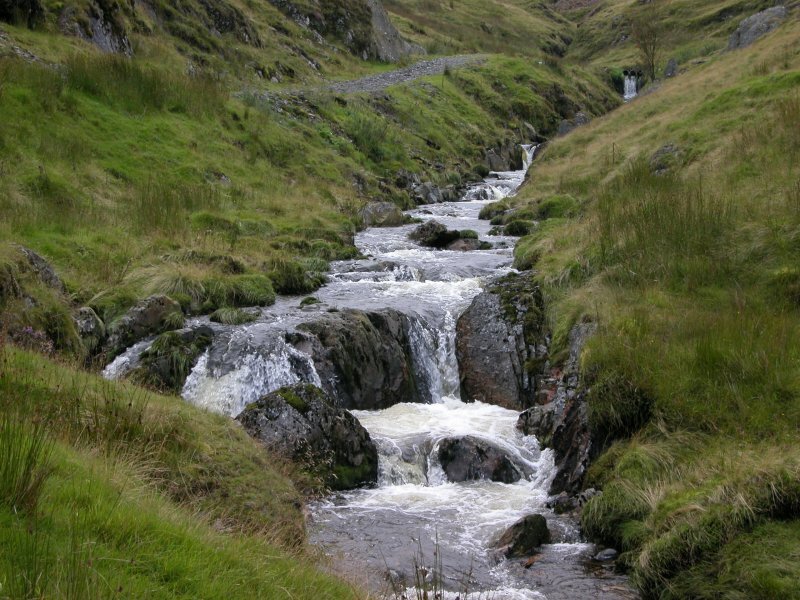 The Cambrian Mountains stretch all the way through Mid Wales, from the Brecon Beacons of South Wales, right up to Snowdonia in North Wales. 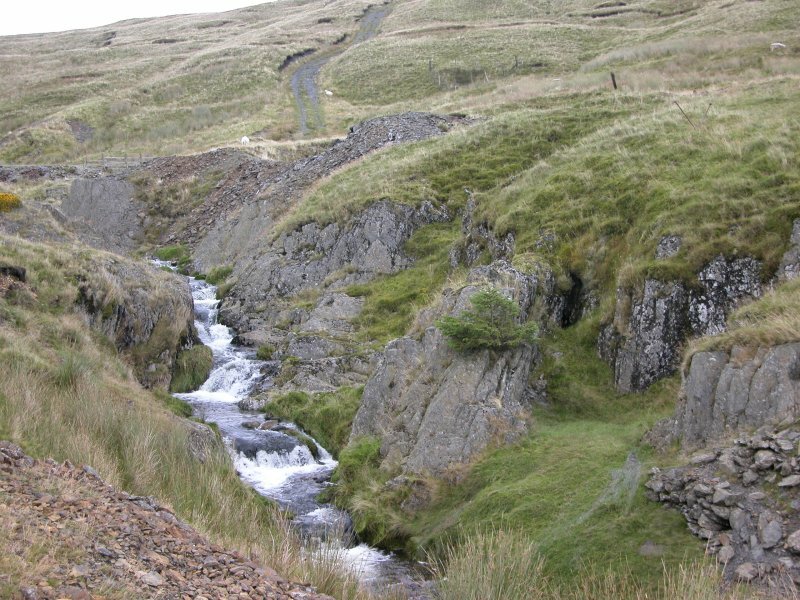 The character of them is so different within Mid Wales, that they earn their own name; Elenydd, though typically the name Cambrian Mountains is used to refer only to the part that makes up Mid Wales. 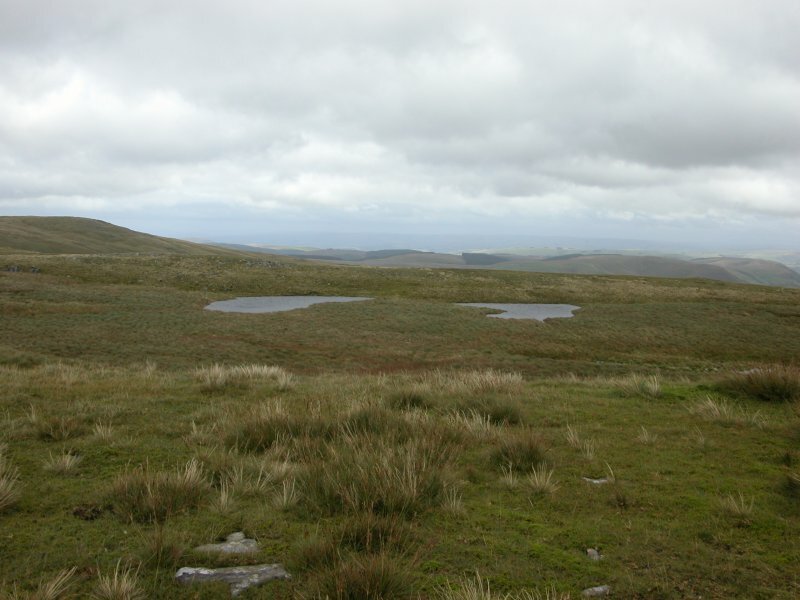 Unlike the mountain ranges at each end, there are virtually no mountain peaks and no massive glacial scarps, and all that remains is a vast area of boggy moorland with very little change. 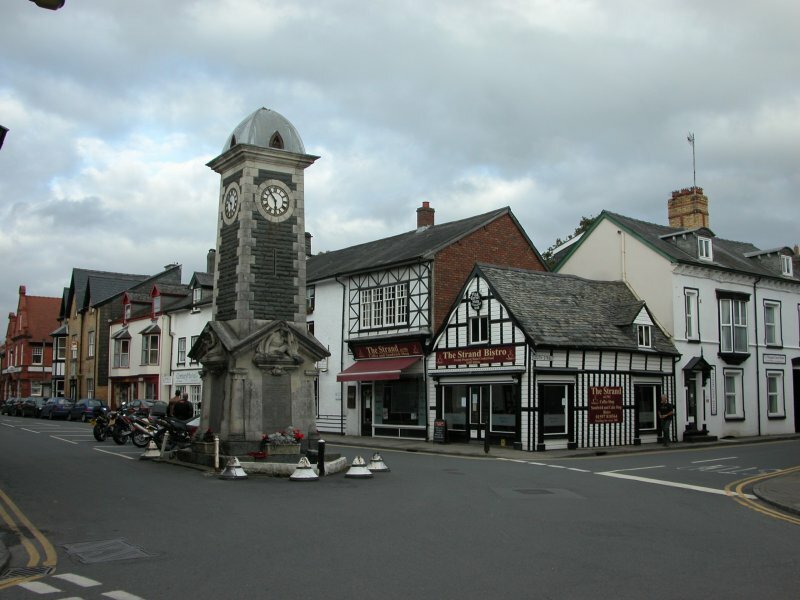 Part of it is even known as the Desert of Wales, due to its barren appearance. I had largely ignored this part of Wales for a long time, perhaps being spoilt by the more important ranges to the north and south, but in all honesty, it's because Mid Wales does not look like it has any mountains at all. They look like hills. Small, bumpy hills. Occasionally, dramatic valleys cut through them, and produce some sense of altitude, but realistically, they all just feel like hills. 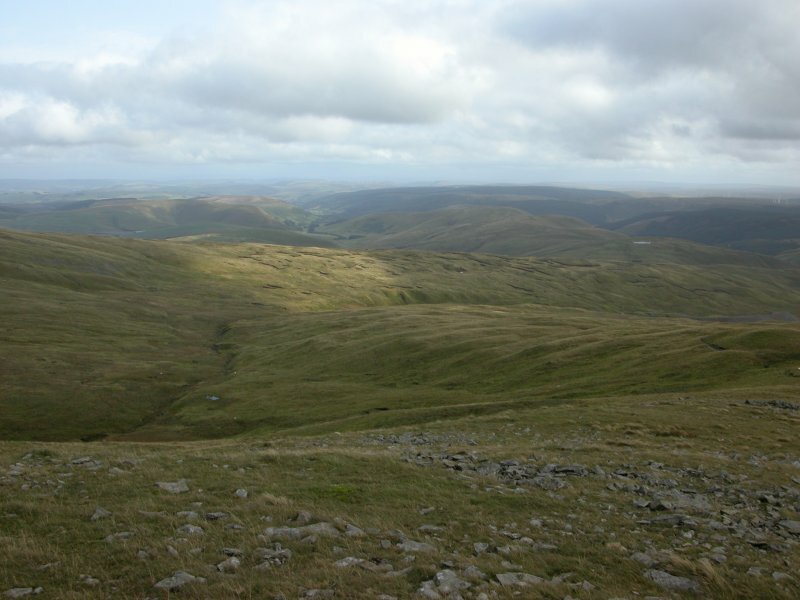 In actual fact, there are four areas containing mountain summits in Mid Wales; Pumlumon near the northern end, the northern Elan Valley area just south of Pumlumon, the southern Elan Valley area even further south, and the Radnor Forest area to the east of that. 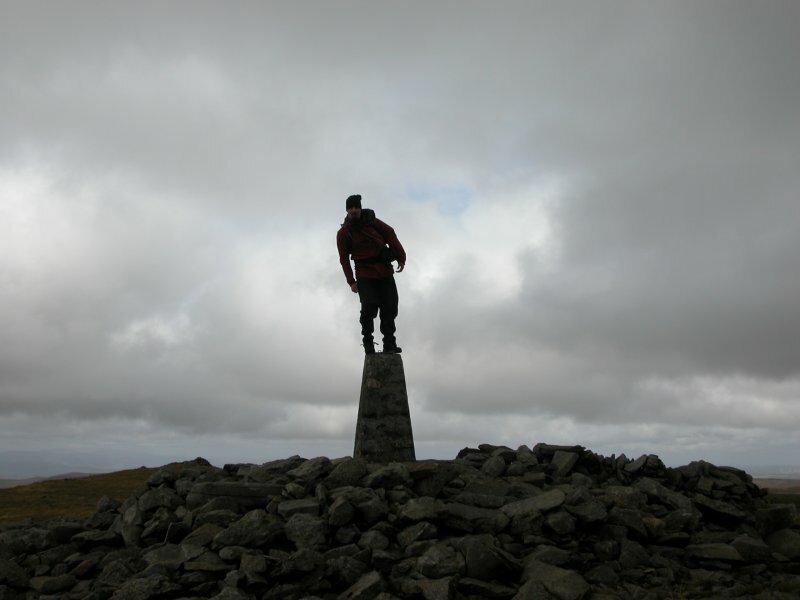 There are no mountain summits in the southern part of Mid Wales. In total, there are 11 mountains, of which the 5 tallest are in the Pumlumon area. 3 of these are over 700 metres high. 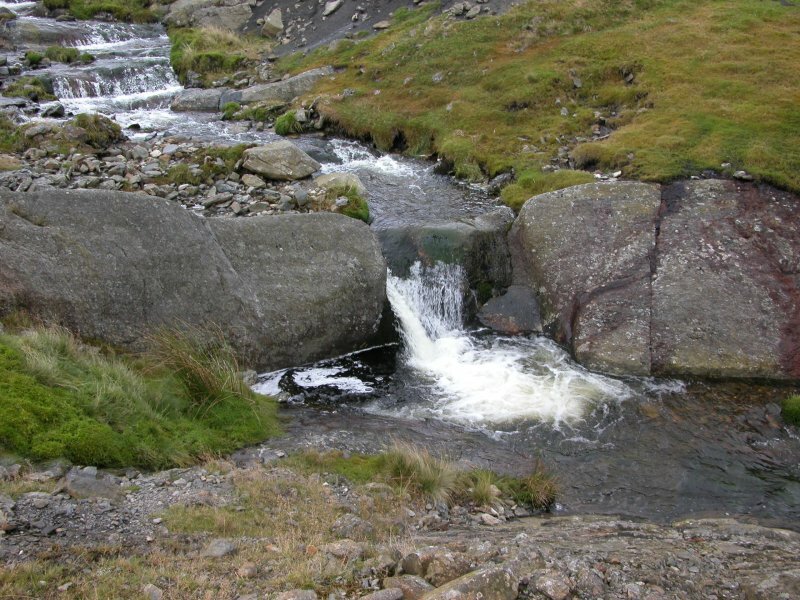 The name Pumlumon is the Welsh form of the name, and the preferred version. Plynlimon is the Anglicised version of the name, stemming from a failure to listen. All of the sounds of the Welsh version are available in English, and could be spelled Pimlimon, but apparently that would be too easy. Since the Welsh version of the name is used for all the other peaks that share it, and the Anglicised version is only applied to the biggest, I will use the Welsh spelling for all peaks. This is also what is used by the Nuttall listings (though not the Hewitt listings). Given that this is a bilingual area, and locals will prefer the original name in either language, it is the right name to use. 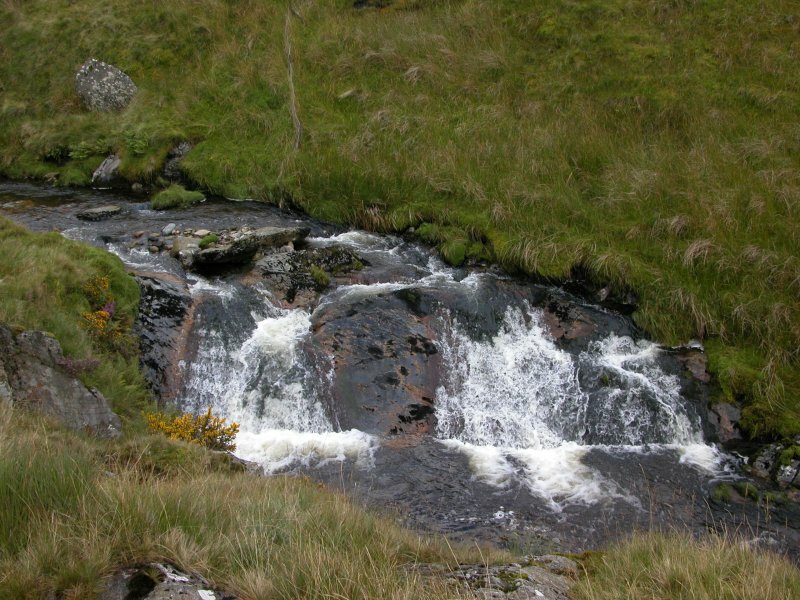 Waterfalls on Nant y Sarn, feeding the River Wye. 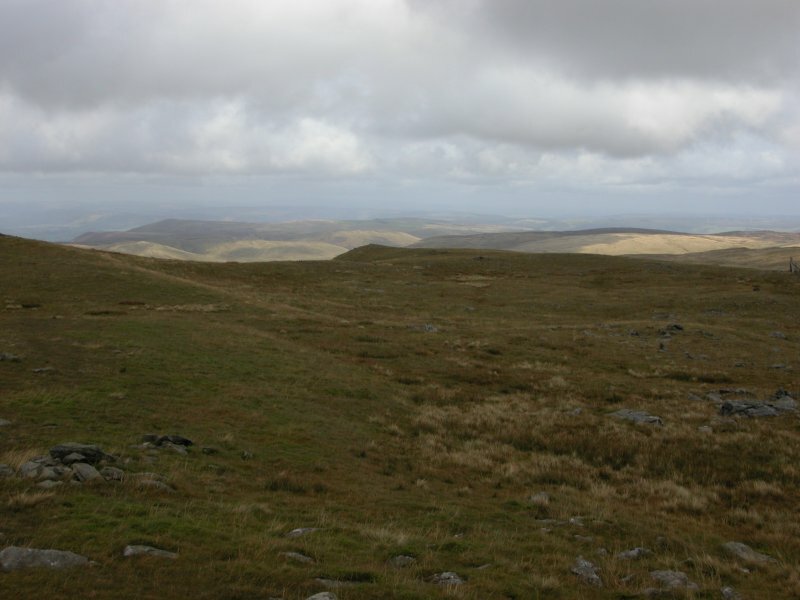 View from the Waun y Dyffryn plateau near Dylife (home of Dylife Gorge and Ffrwd Fawr). 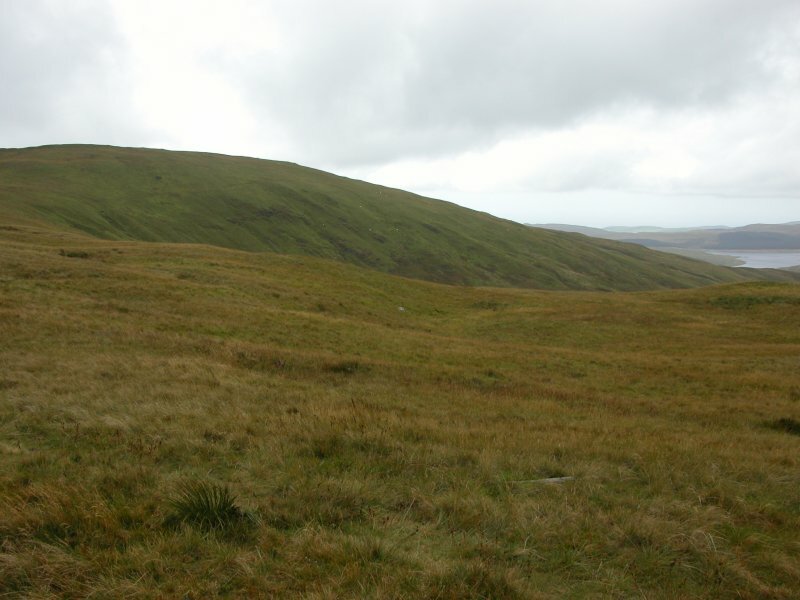 The nearest ridge on the left is Y Grug (520 metres) and Banc Bugeilyn (551 metres). Behind Banc Bugeilyn are the three main Pumlumon peaks, with the river Severn rising on the low moorland immediately behind Banc Bugeilyn. On the right are the Glaslyn lake, Siambr Trawsfynydd (582 metres) and Foel Fadian (564 metres). 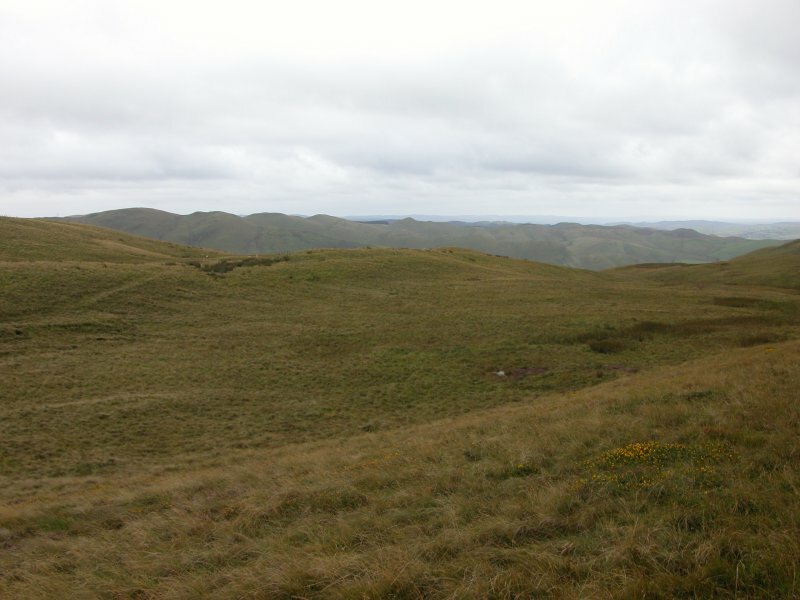 Northern escarpment of the range, which basically spells the end of the Mid Wales mountains, and the start of Snowdonia. On the left are Foel Fadian and Foel Esgair-y-llyn (505 metre buttress). 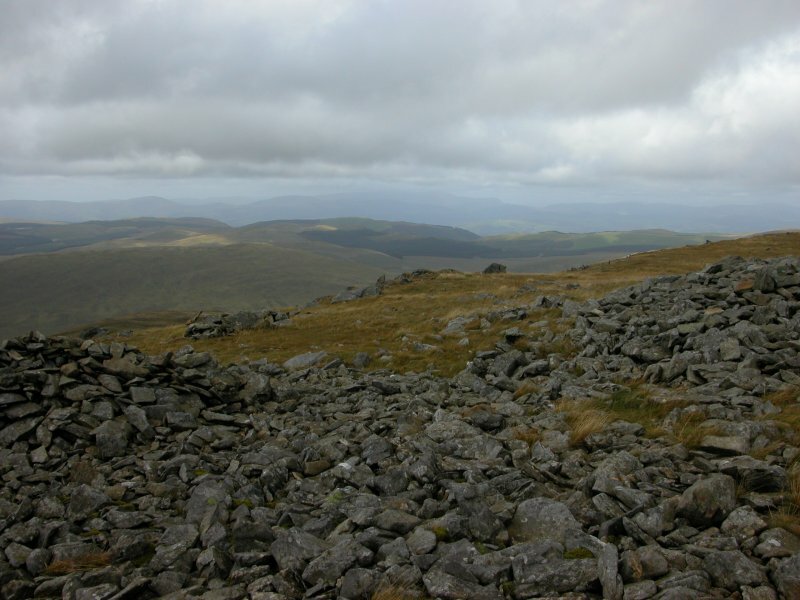 Then the low rumbling ridge of Siambr Trawsfynydd and Llechwedd Diflas (519 metres max - the name literally means Boring Hillside), and finally the last two mountains Pen y Darren (529 metres) and Pen Creigiau'r Llan (507 metres). 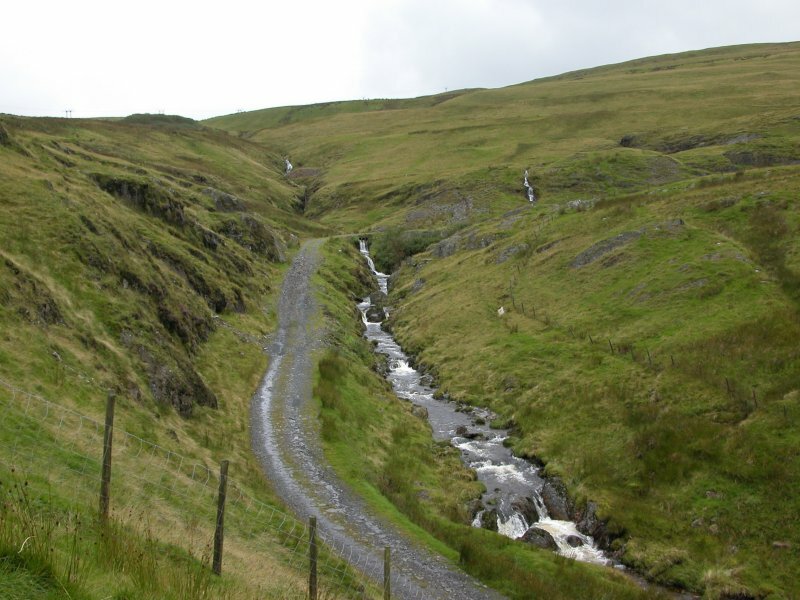 Heading up the Llyfnant valley, between Pen y Darren and Pen Creigiau'r Llan. 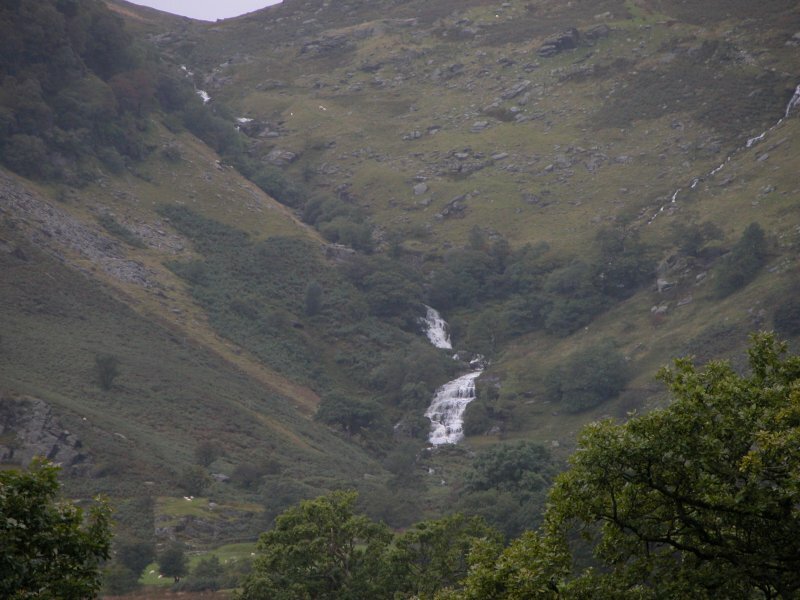 The valley is known by the imaginative title "Cwm Rhaeadr" (or Rhaiadr) - waterfall valley. 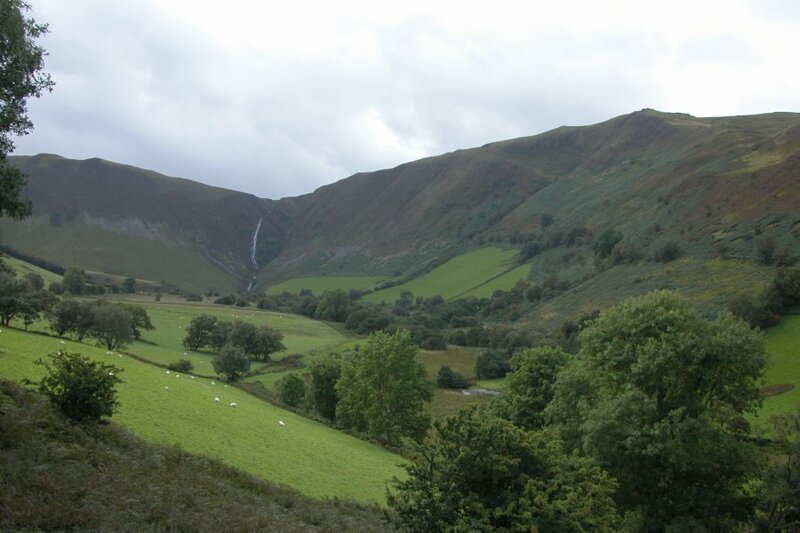 The path down the valley gives plenty of views of the dominating waterfall of Pistyll y Llyn. (Be warned that the path gets seriously boggy in places after rain, and this field is a marsh, hiding under deep grass.) 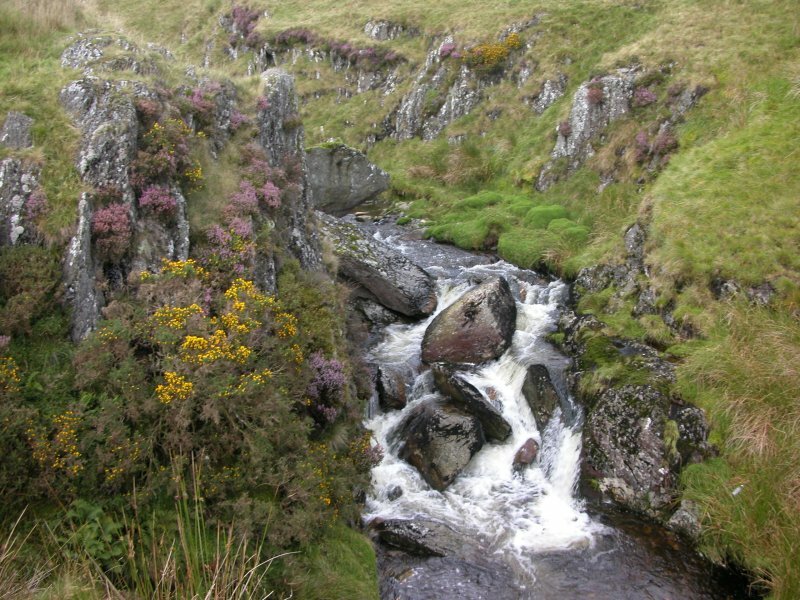 At Pistyll y Llyn, the Llyfnant drops from 370 metres to 210 metres, totalling 160 metres, in two horsetail falls, and one set of cascades. 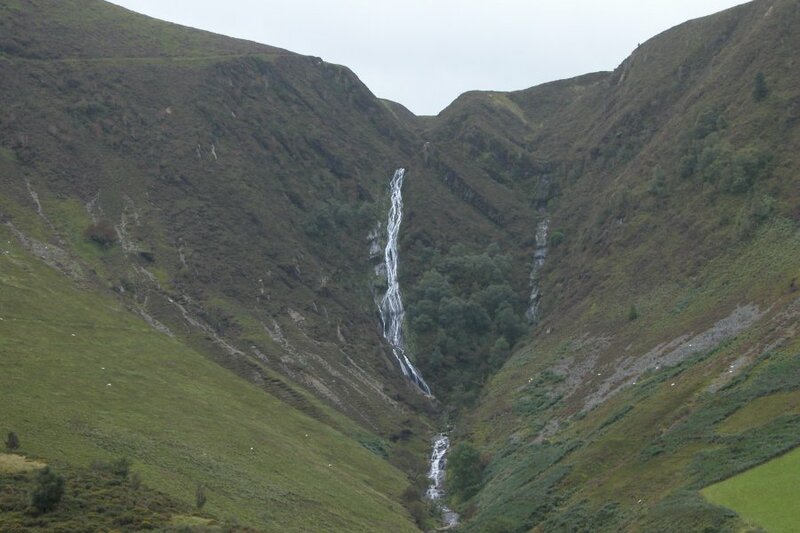 The tallest single waterfall is the middle horsetail fall, at a seriously impressive 91 metres, turning a corner around 20 metres before the bottom. 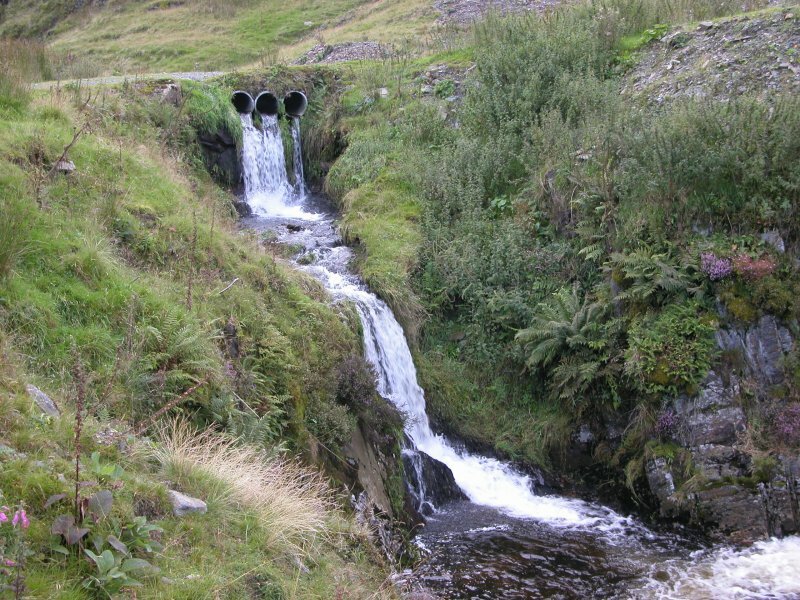 Some locals refer to it simply as Cwm Rhaiadr Falls. 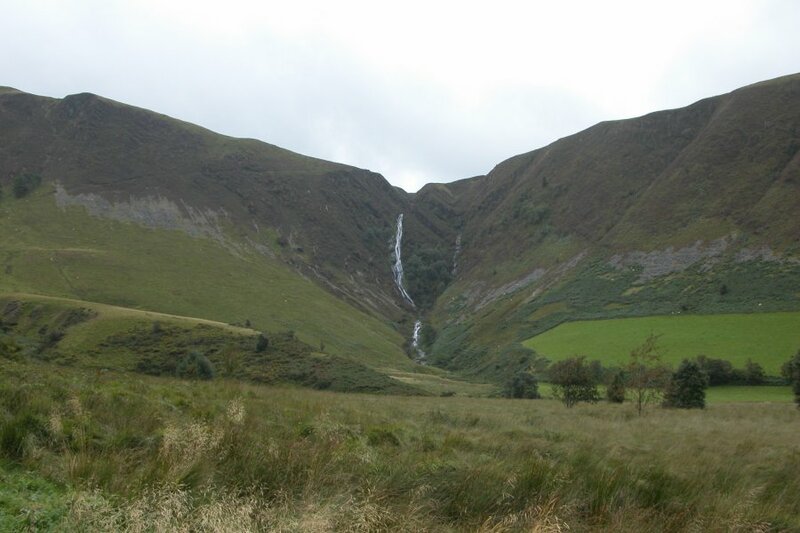 Being a horsetail (meaning it runs down the very steeply sloping bedrock, and never makes a clean jump), it is sometimes discounted when listing the tallest waterfalls in Wales, though it should rightfully hold second place, after the Devil's Appendix. 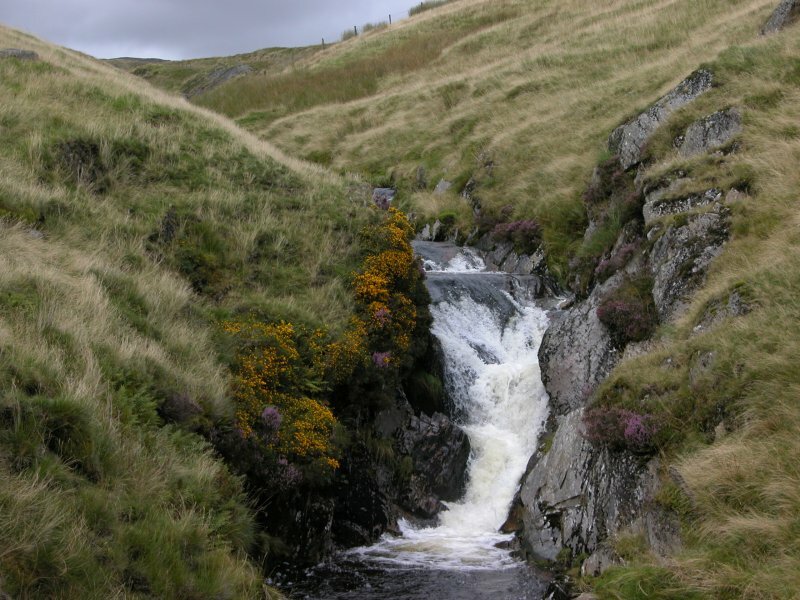 It is also sometimes quoted as 73 metres tall, perhaps confusing it with Pistyll Rhaeadr, or perhaps measuring it only until it turns the corner, even though it is clearly the same horsetail. No doubt someone will probably make a huge deal out of it one way or the other, but really, it's 91 metres of horsetail waterfall, and that is impressive. 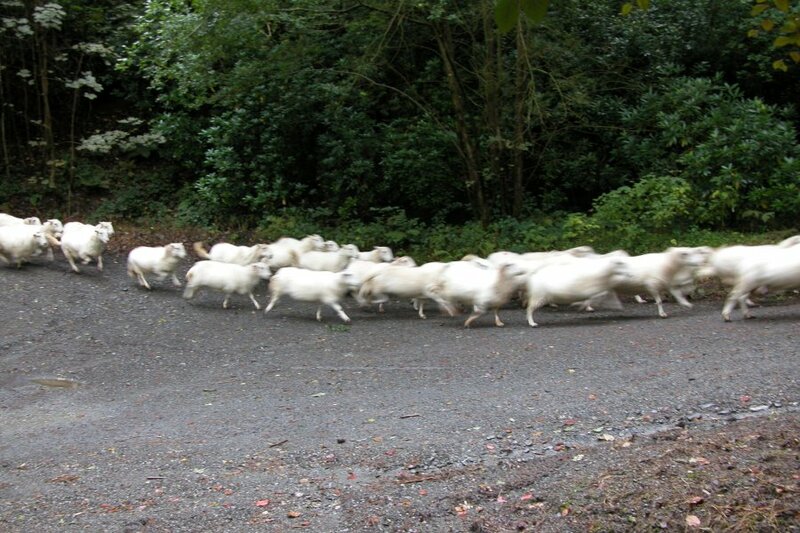 The scenic route turned out to be a bit more scenic than we were hoping for - Coed Hiraeth. 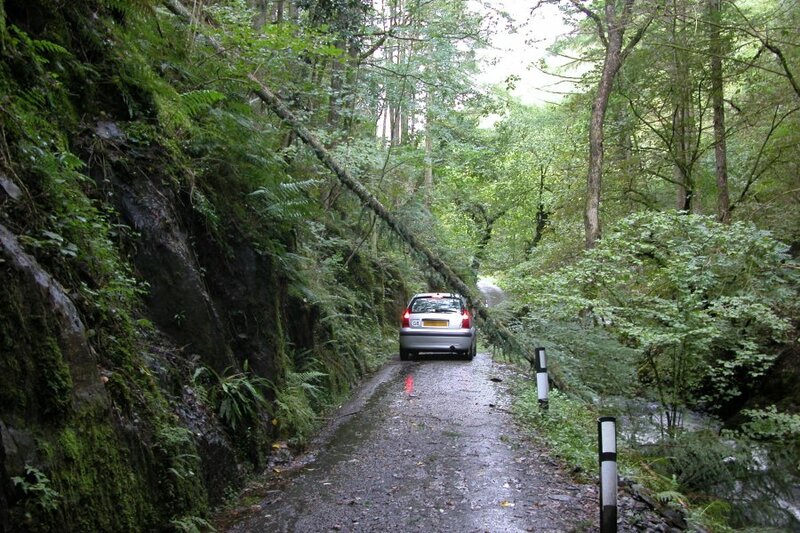 Virtually abandoned road along the Llyfnant Valley. 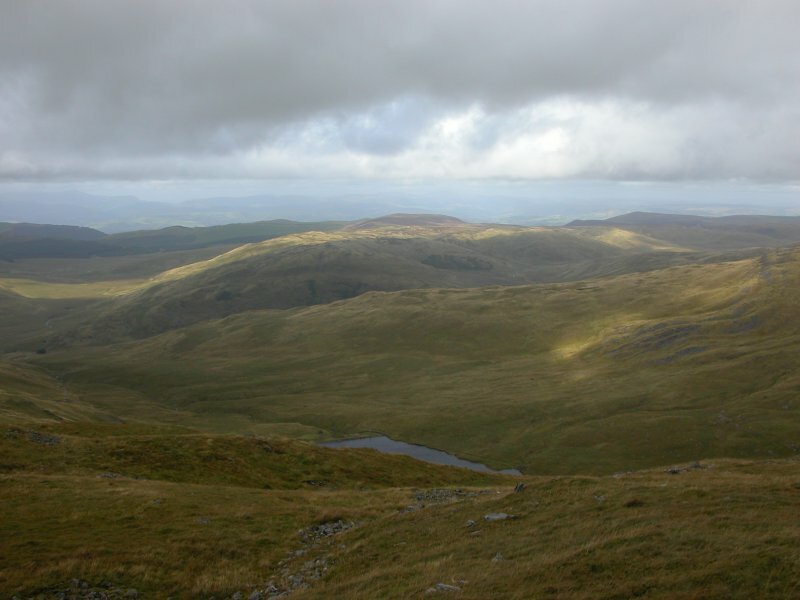 The Tarren Hills, in the Cadair Idris range in Snowdonia. 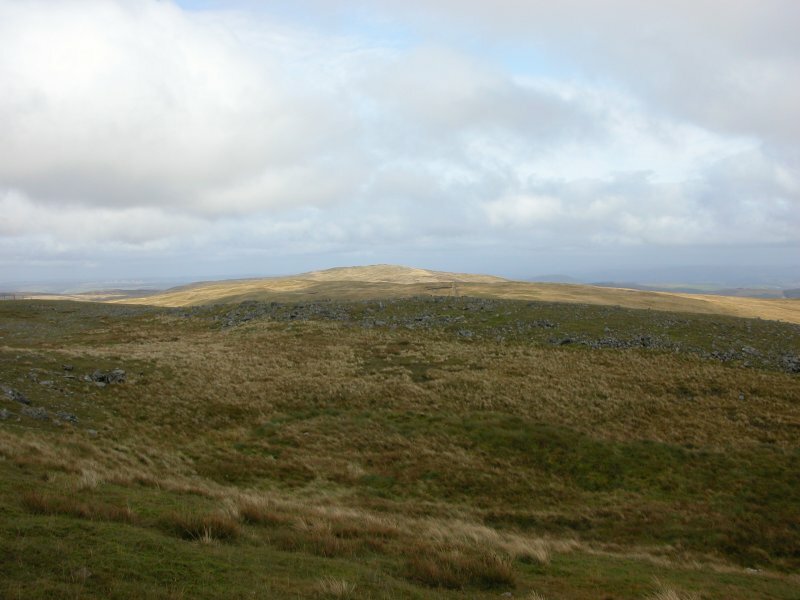 The two main tops are Tarrenhendre (634 metres) and Tarren y Gesail (667 metres). Nant y Maen, between the Crib yr Esgair ridge and Cripiau Eisteddfa-fach (540 metres). Our route starts above the end of the Afon Tarennig, heading up to the treeline of Y Garn, and will return on the lower track seen here. This route is said to be dreary because of the dirt tracks, but it's also the easiest, and that was appropriate for today. Looking back down the tracks. Ahead are the two ridges of Crib yr Esgair and Cripiau Eisteddfa-fach. The main three peaks are on the left, hidden by the cloud. The weather had been occasional heavy rain and low cloud, but thankfully, it cleared up exactly where we needed it, exactly when we needed it. 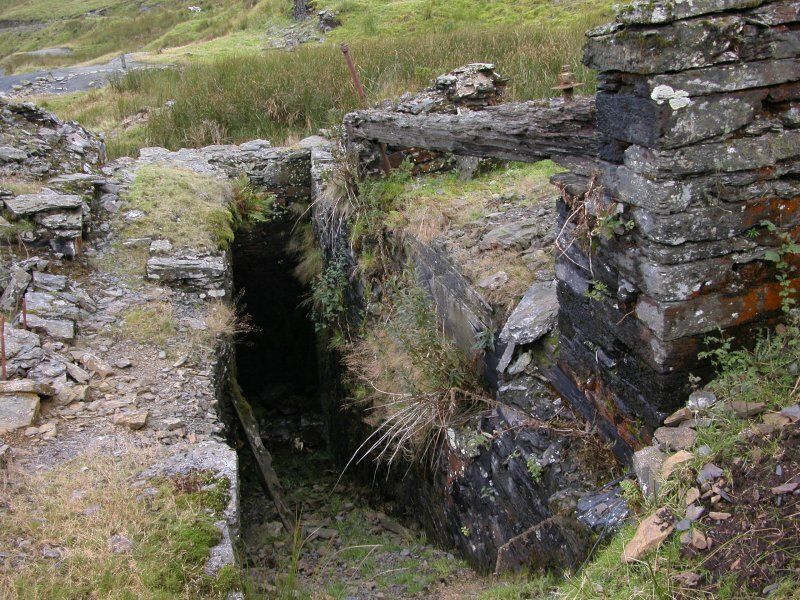 Remains of an old mine at Yr Ochrydd. 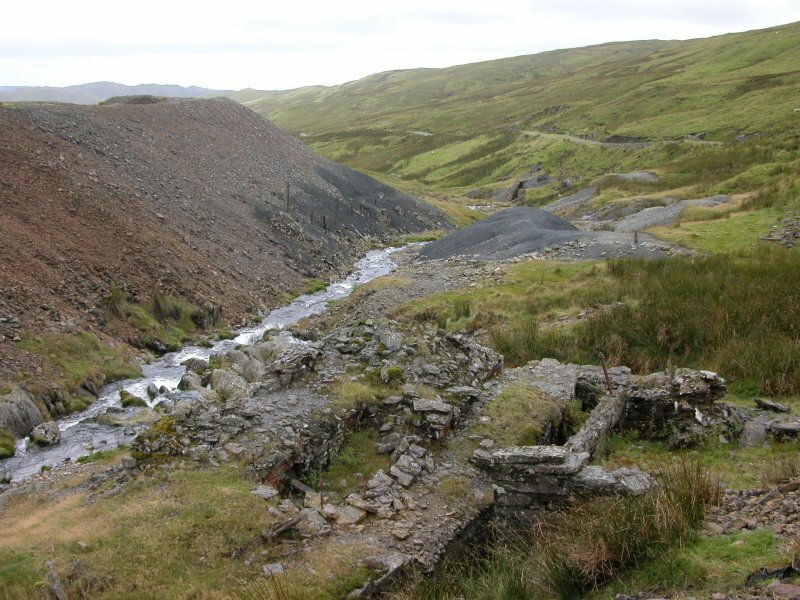 Like much of the area, there are remains of old metal mines, particularly lead and precious metals. Despite its name, this is not an ochre mine, the name means The Side. 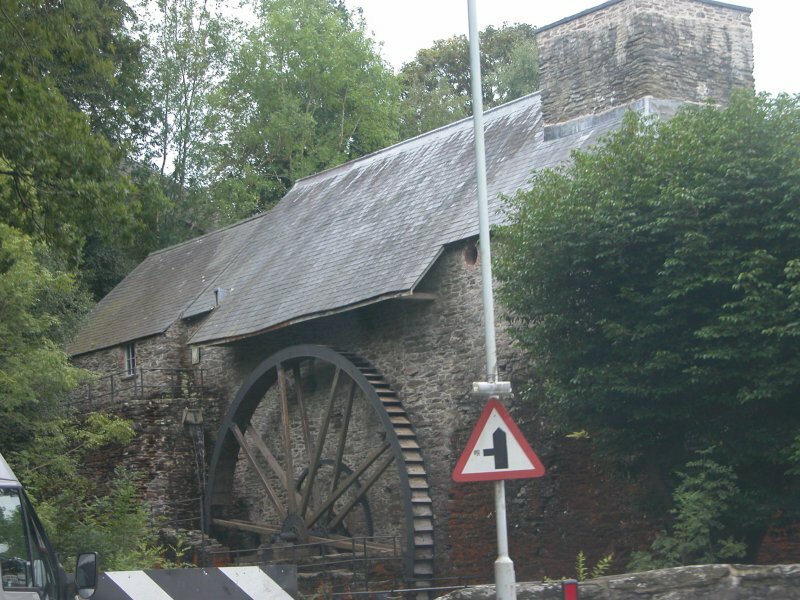 The mines here were lead mines, operating until about 115 years ago. 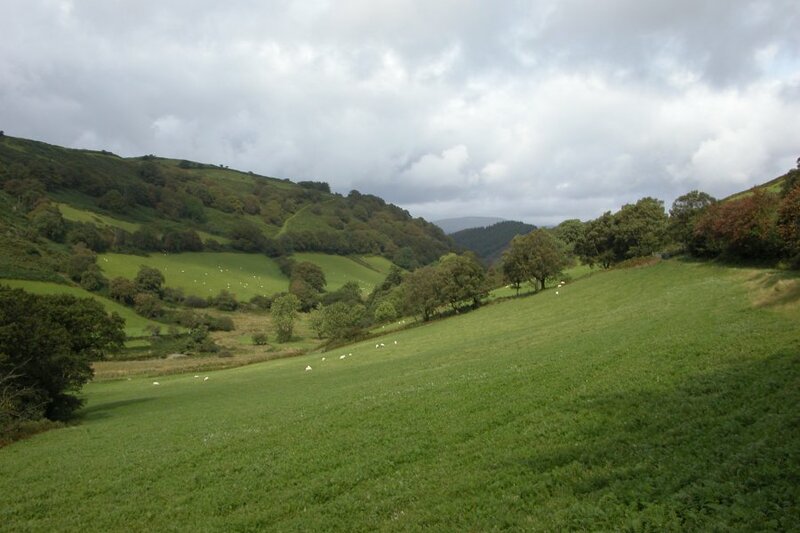 Looking over the Afon Castell valley to a distinctive range of lumpy hill-tops. The tallest (on the left) is Draws Drum at just over 570 metres, but just behind it - barely peering over the ridge, is Pen y Garn (610 metres), the only mountain between here and the southern Elan Valley. It only just qualifies as a mountain top. 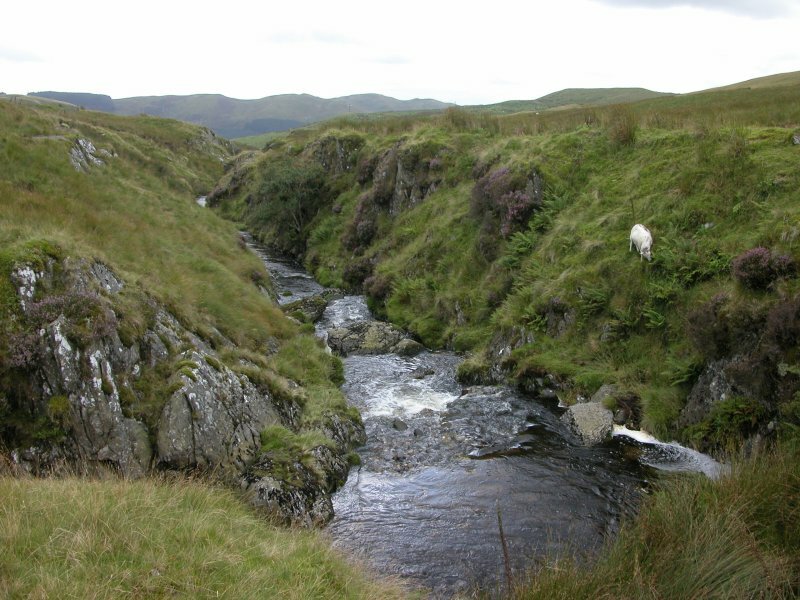 View into the downstream Tarennig, where it becomes a proper river valley between Cripiau Eisteddfa-fach and Periadd Fynydd (547 metres). 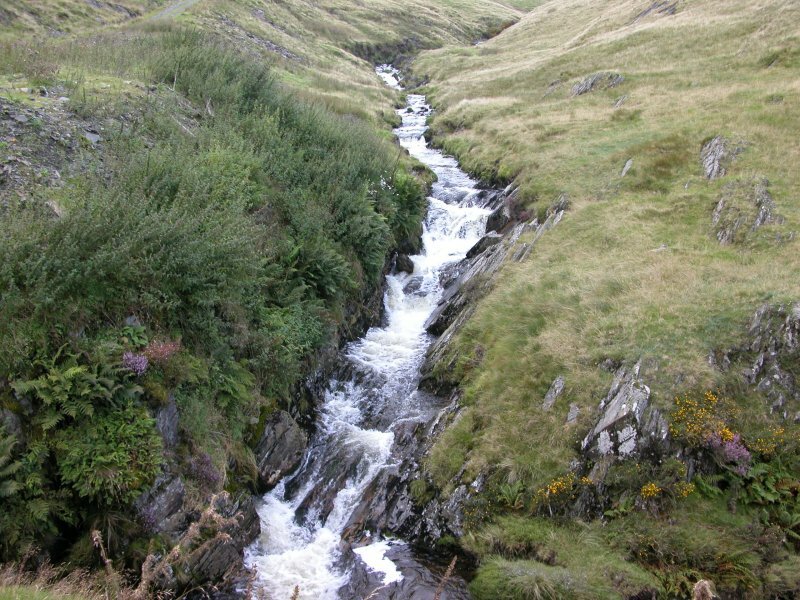 Behind the dip of Cripiau Eisteddfa-fach (the part on the right is Llechwedd Hirgoed - 538 and 535 metres) is Y Foel (546 metres). 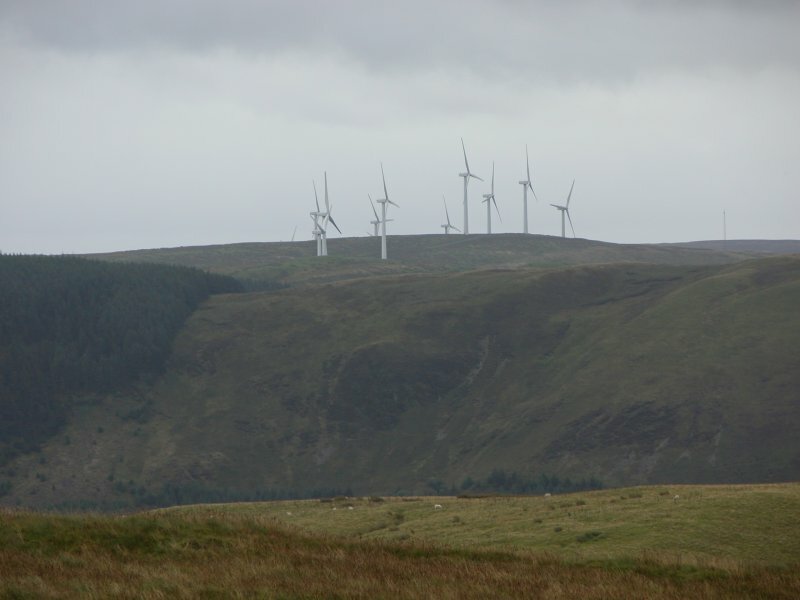 Cefn Croes wind farm, one of many in Mid Wales. 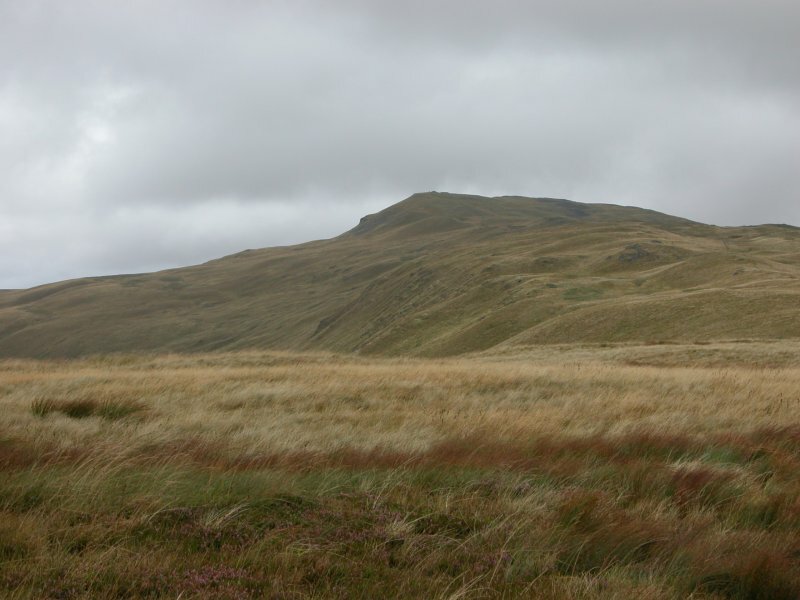 The three main peaks of Pumlumon, and the tallest mountains in Mid Wales; Pumlumon Fawr (752 metres), the double bumps of Pen Pumlumon Llygad-bychan (727 metres) and its Pen Lluest-y-carn buttress, and the point of Pen Pumlumon Arwystli (741 metres). The river Wye rises between the last two. 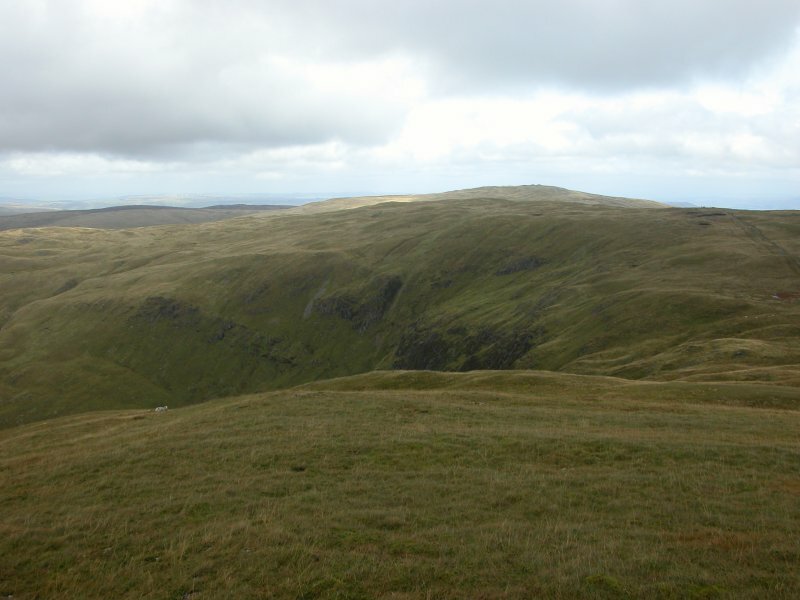 Pumlumon Fawr, seen from the Pen y Drawsallt ridge. 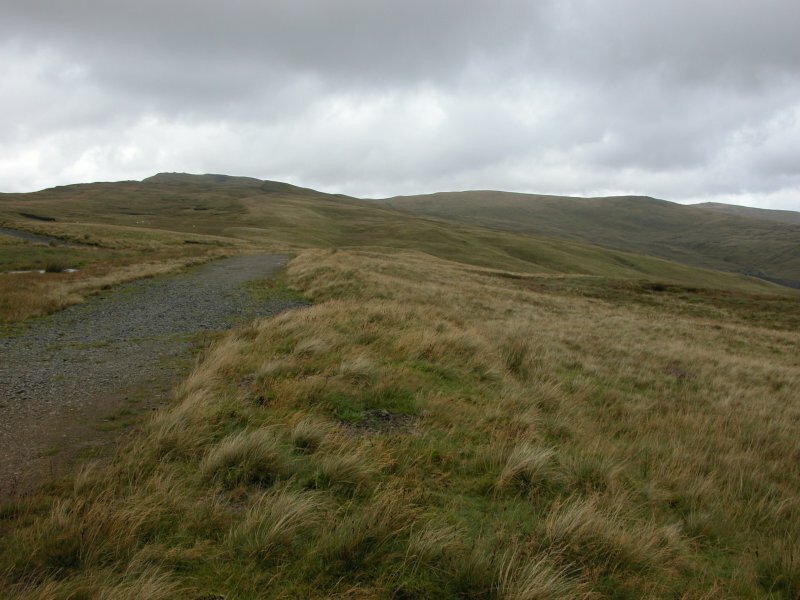 On the left flank, one of the tiny bumps is the top of Pumlumon Fach (664 metres), the fifth tallest mountain in Mid Wales. 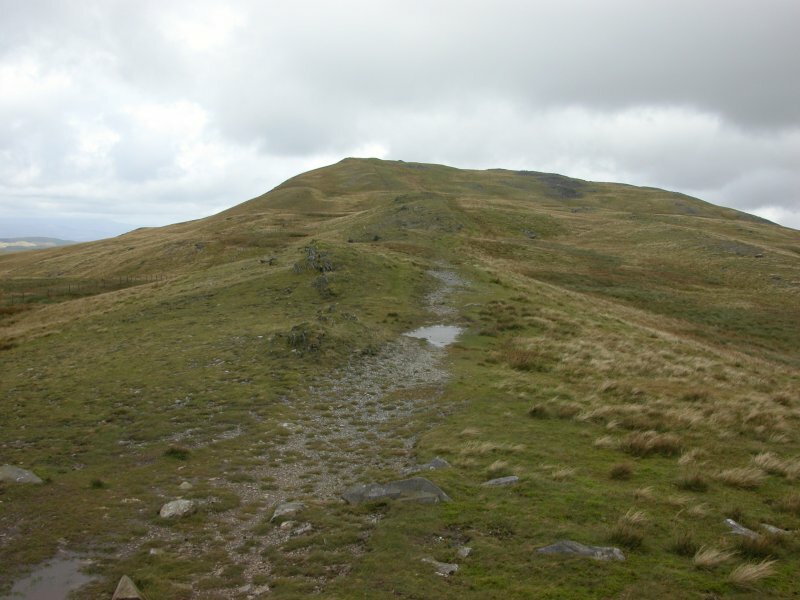 Y Garn (684 metres), the fourth tallest mountain in Mid Wales, at the other end of the Pen y Drawsallt ridge. The Pen y Drawsallt ridge. View to the west from the ridge. 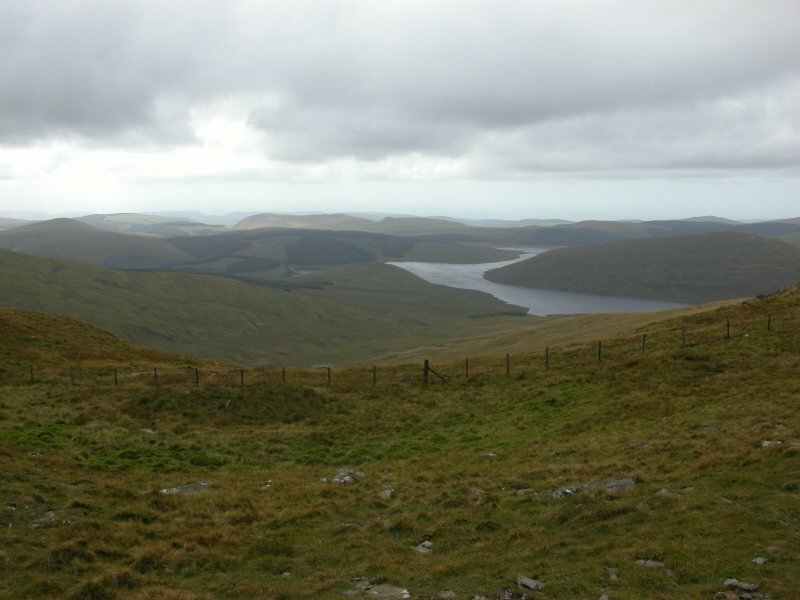 The pointed hill on the left is Disgwylfa Fawr (507 metres), and the obvious hill on the right above the Nant-y-moch Reservoir is Drosgol (550 metres). Behind Drosgol is the forested plateau extending all the way to Pistyll y Llyn, with the edge of the Tarren Hills behind it. To the right of Disgwylfa Fawr are Banc y Garn (437 metres), Pen Craigypistyll (455 metres) and Banc Sychnant (444 metres). 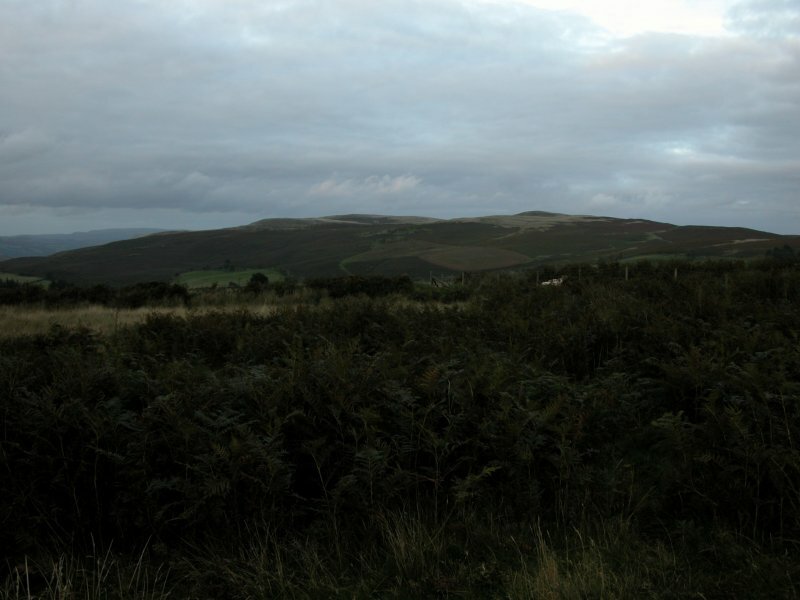 In the distance between Disgwylfa Fawr and Pen Craigypistyll are the coast and small hills at Aberystwyth. 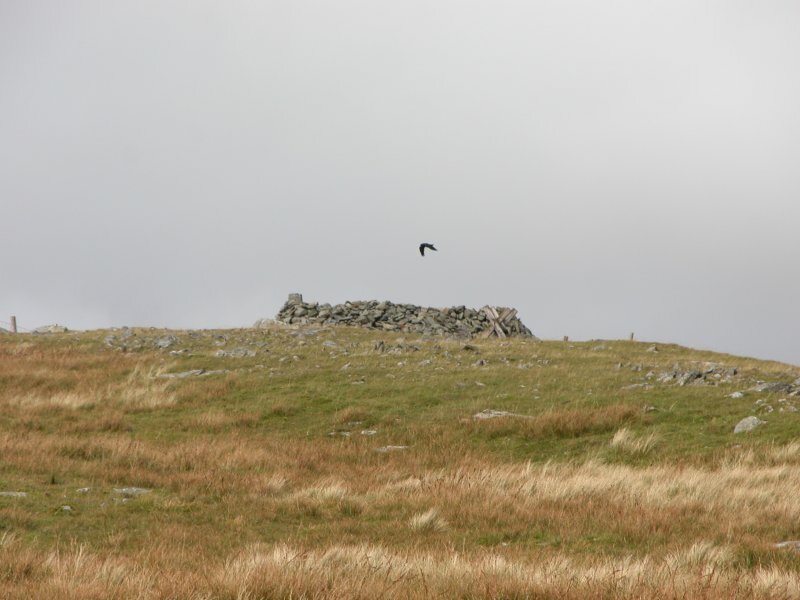 Raven over the top of Pumlumon Fawr. Demonstration of the winds at the top. Pen Pumlumon Llygad-bychan and Pen Pumlumon Arwystli. Graig Las crags on Pen Pumlumon Llygad-bychan. Banc Bugeilyn and Bryn Cras. 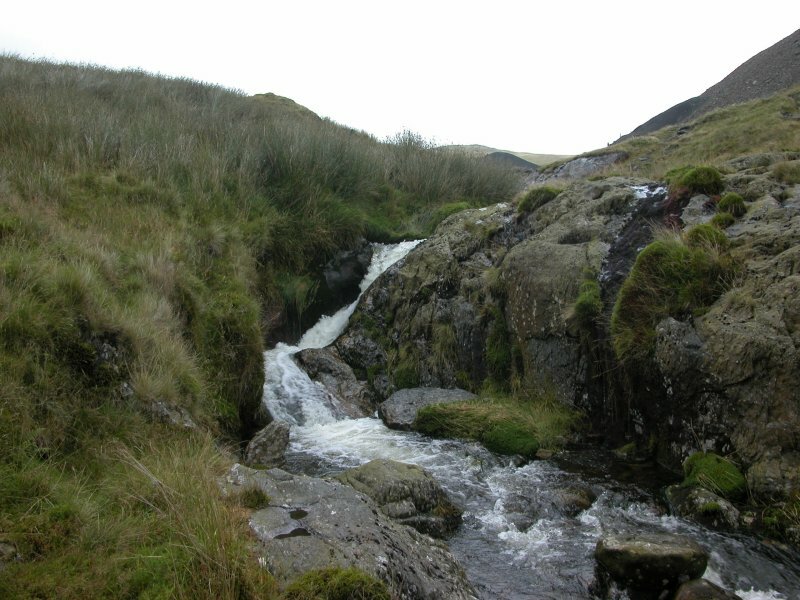 Bryn Cras is part of the flat moorland that extends from the northern side of Pen Pumlumon Arwystli, the source of the River Severn. Light on the Hyddgen Ridge. 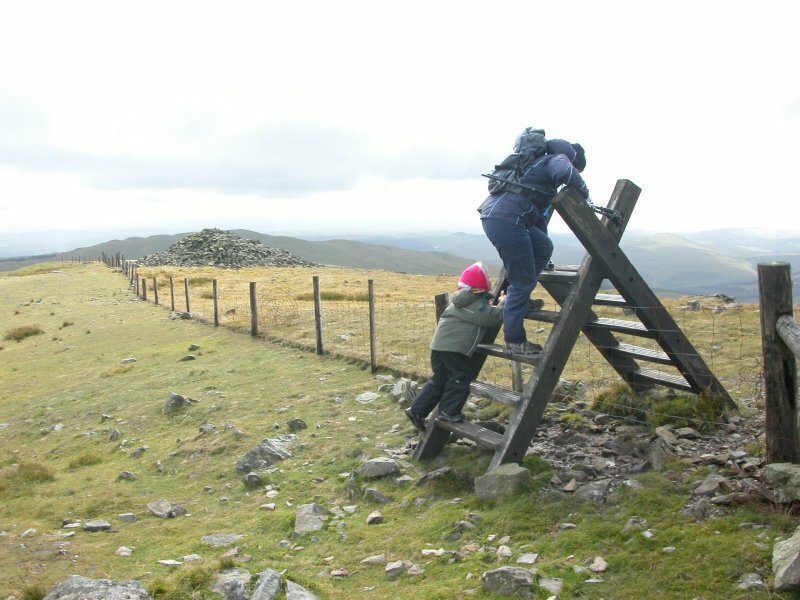 This tops out at Carn Gwilym (566 metres), then extends back to connect to Siambr Trawsfynydd. There are so many names on the way that I have no idea which is the right name for this plateau. View over Pistyll y Llyn to the Tarren Hills and Cadair Idris (893 metres) in Snowdonia. At the bottom on the left is the top of Pumlumon Fach. Looking back down the Tarennig valley. 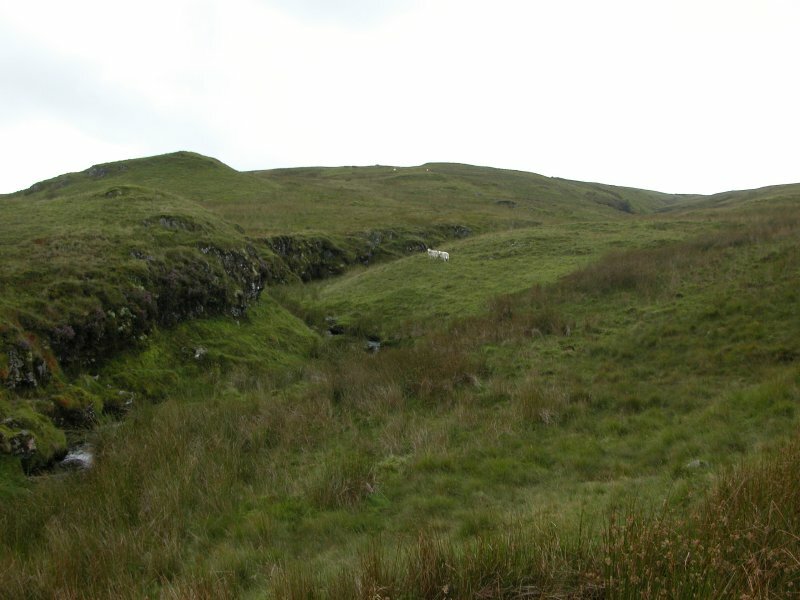 The mining spoil at the right is the remnant of a mine, and the path down leads towards it. Elevated spring at the source of the Tarennig. 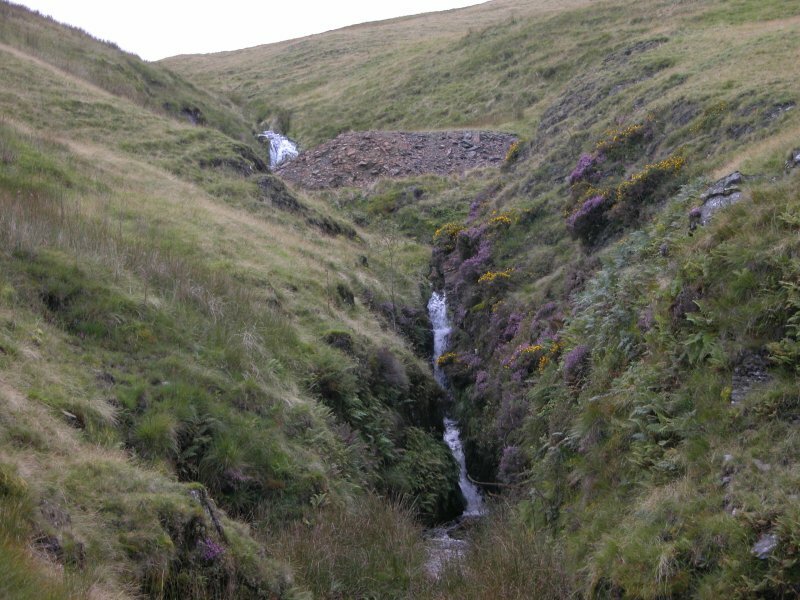 The Pumlumon Mine entrance can be seen at the upstream end of the spoil as a small hole. 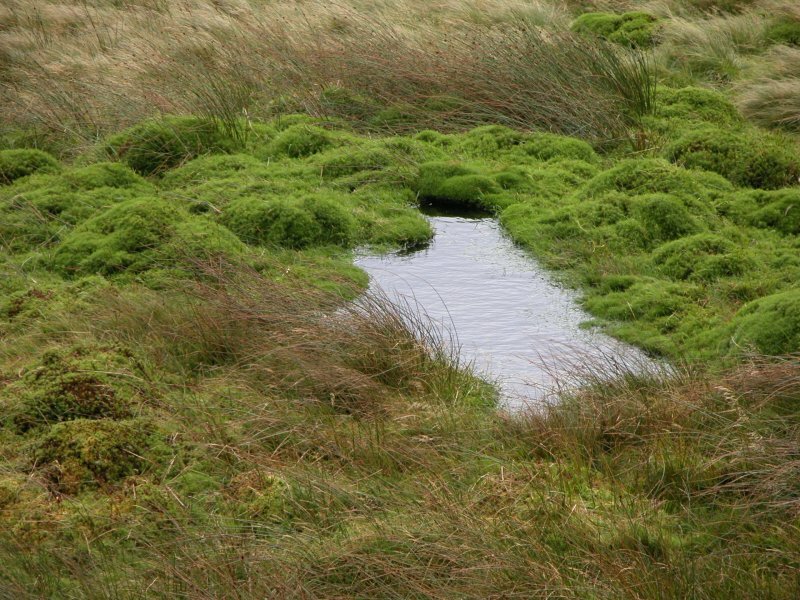 The ground in front of it is far too boggy to walk on, and it bounces due the the water trapped under it. 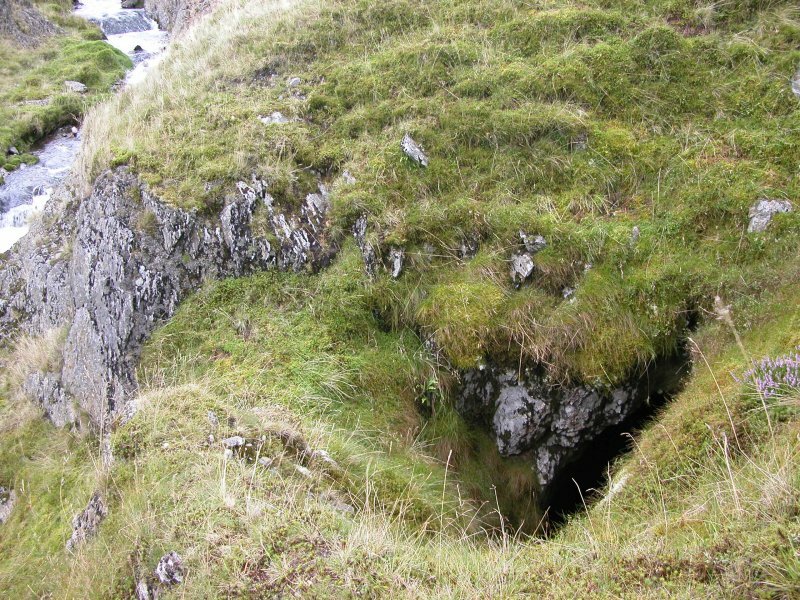 Just above it, a collapse drops into the short mine adit. While it is possible to descend the collapse into the adit, it is definitely not advisable, even for cavers. 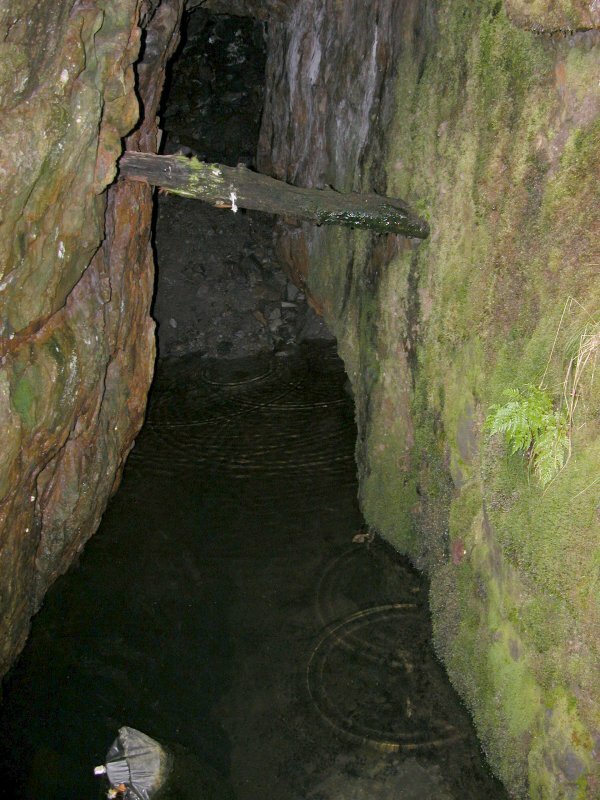 The short adit, with a run-in at the end. 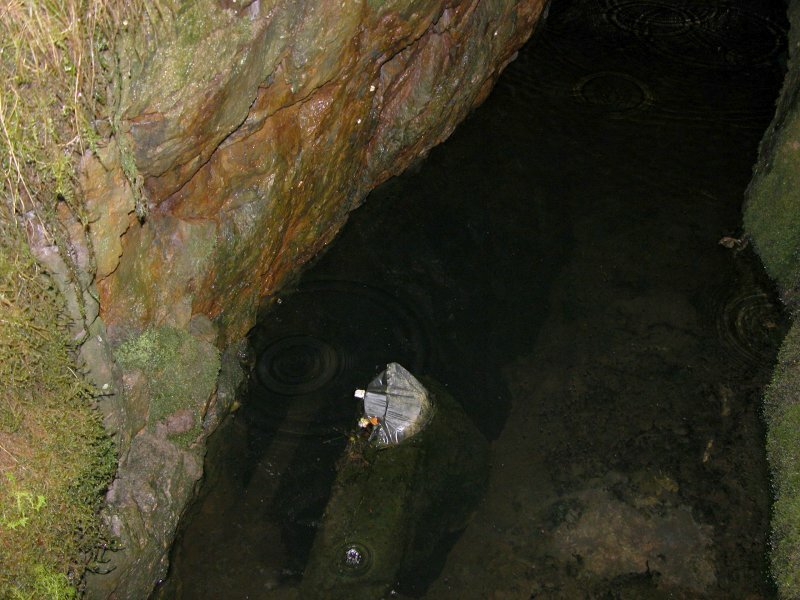 The floor is not a floor, it is the head of a flooded shaft, which is probably about 70+ metres deep. Climbing back out of the collapse entrance directly above this shaft certainly does not feel safe at all. 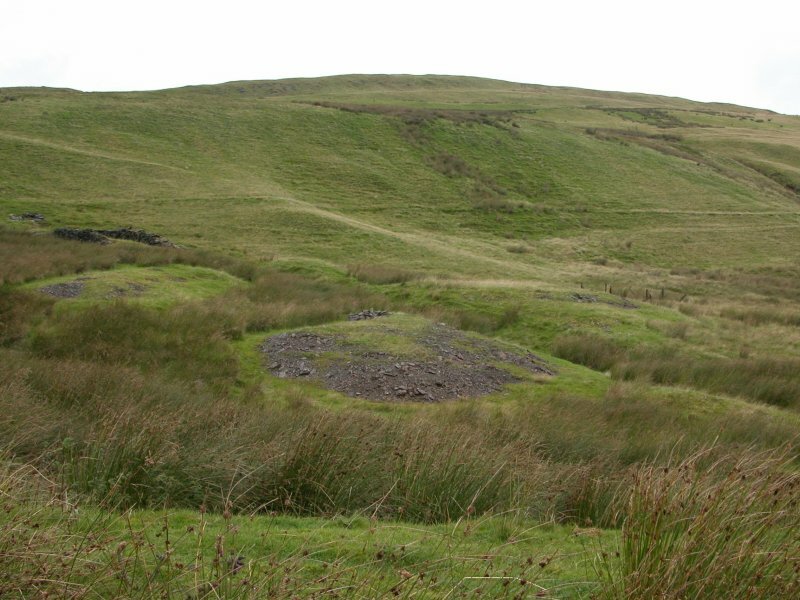 Mining spoil and remains of the mine. 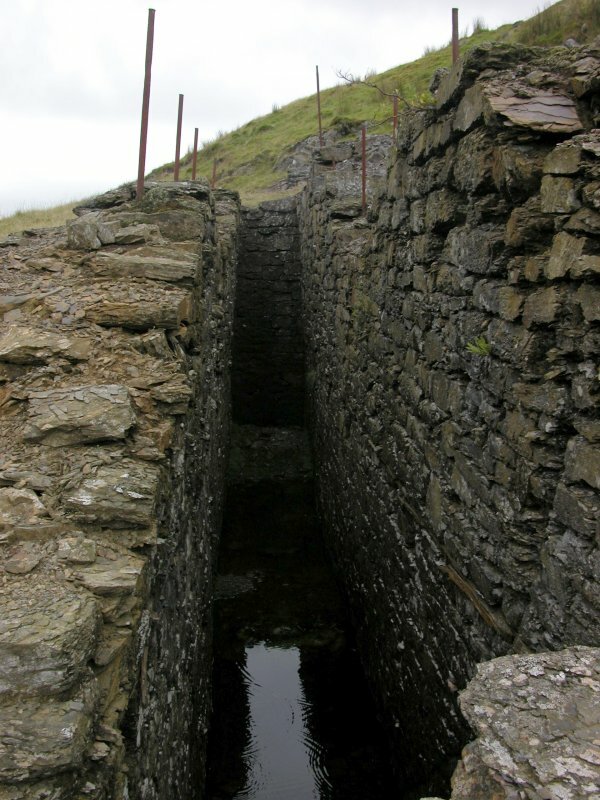 What looks like the remains of a waterwheel at the mine. Presumably, this would have been used to pump the water out of that mine shaft, or to lift minerals. 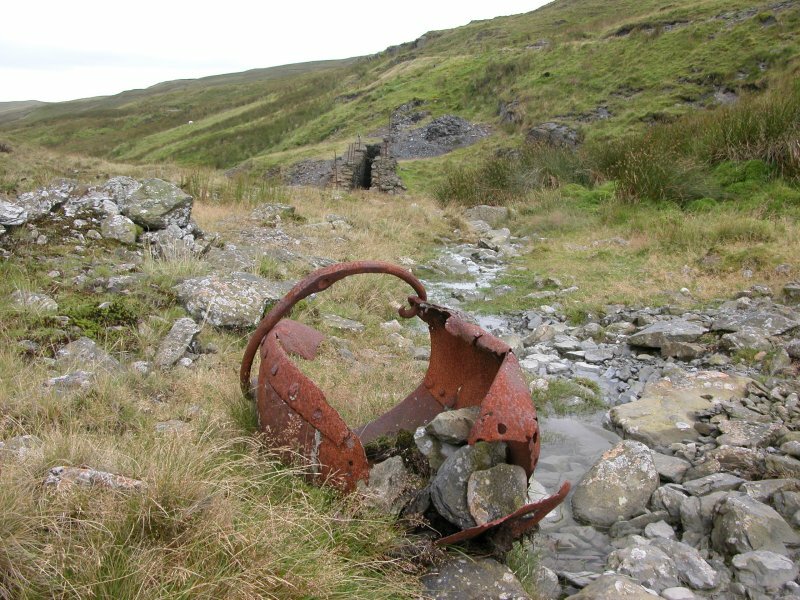 Remains of an old winch bucket. Larger cascade at the mine. Remains of another waterwheel housing. Small gorge of an inlet stream. Cascades on the Nod inlet stream. More cascades as it joing the Tarennig. 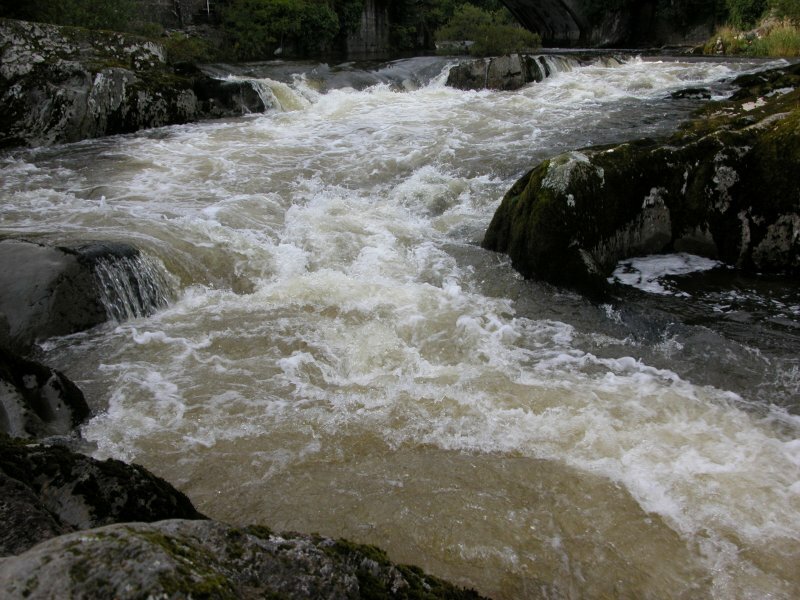 End of the Tarennig cascades. 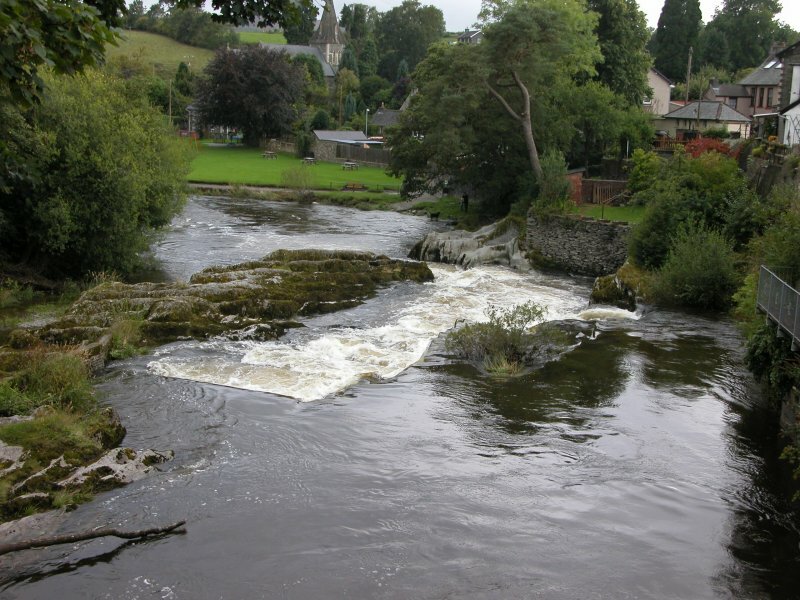 Some time later, the river joins the Wye. 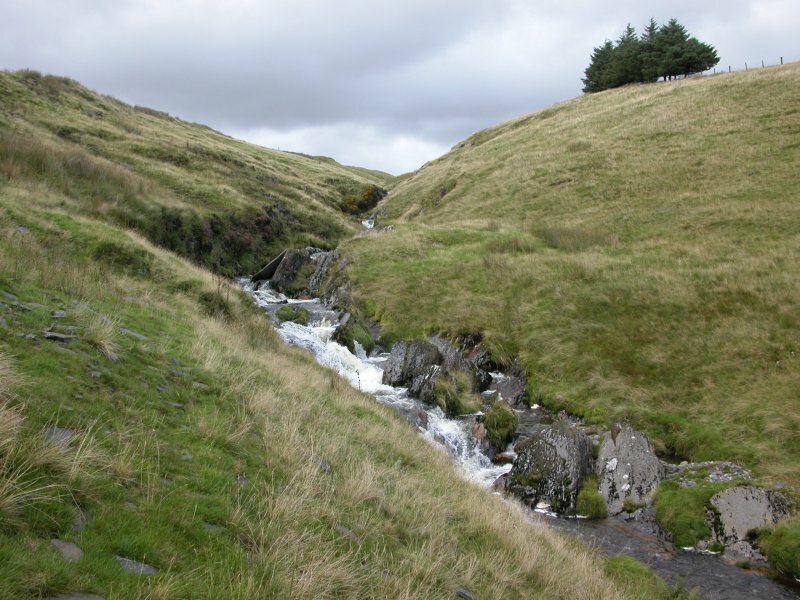 Downstream at Rhayader (another Anglicisation), there used to be a big waterfall called Rhaeadr Gwy. 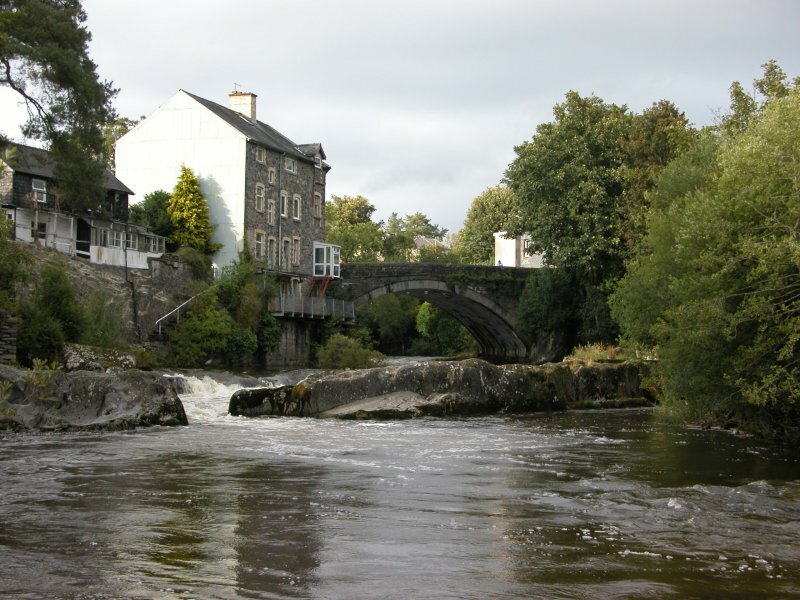 It was largely destroyed to build a bridge in 1780, leaving only a small cascade. Salmon weirs were added, and one was destroyed by flooding in 1947. 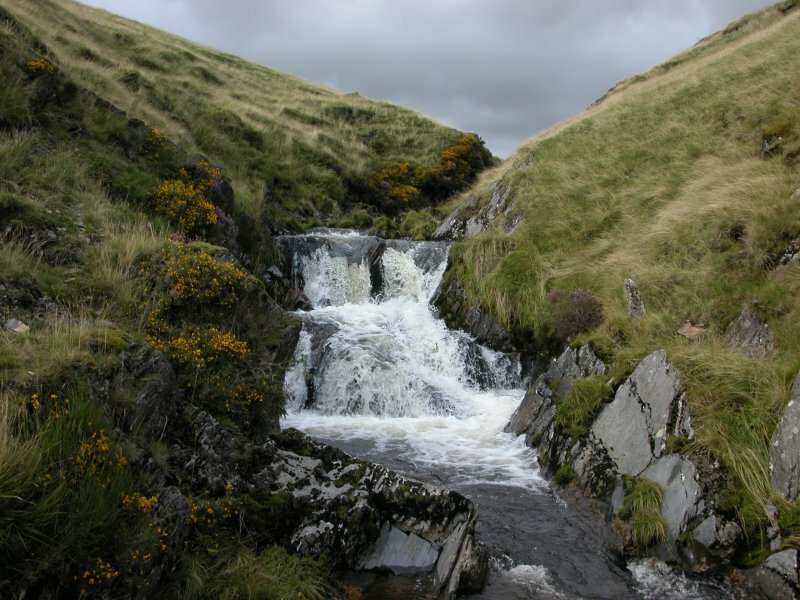 That left only this; a partly natural cascade, and partly unnatural salmon leap. 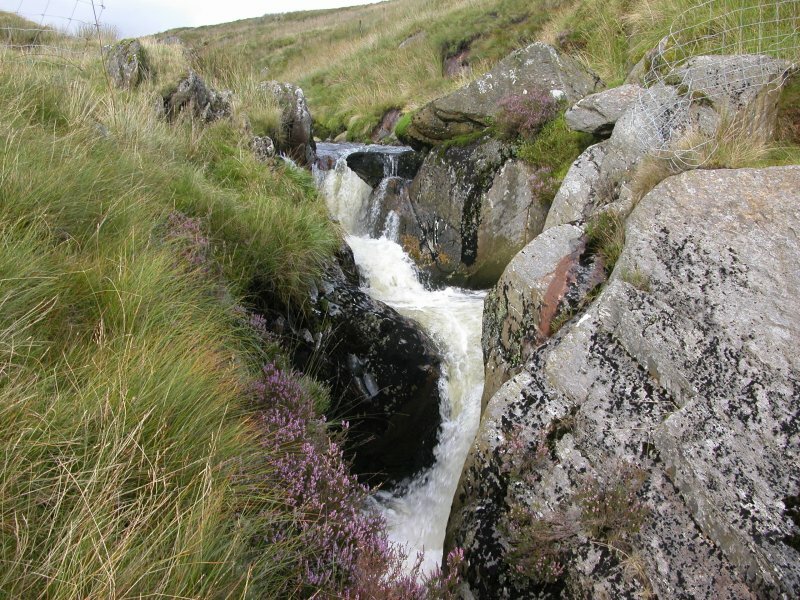 The town grew around the waterfall, and still retains the name, even though the waterfall itself is missing. 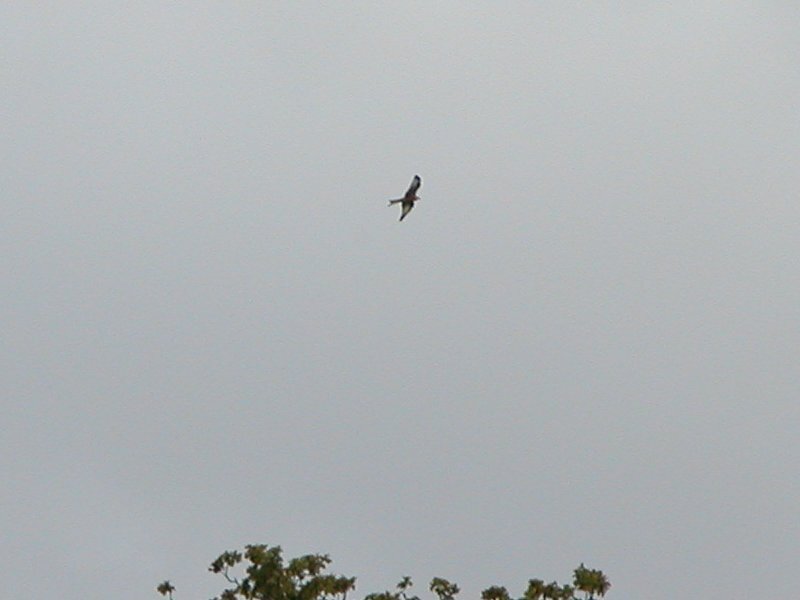 One of the many red kites that frequent the feeding centre here. 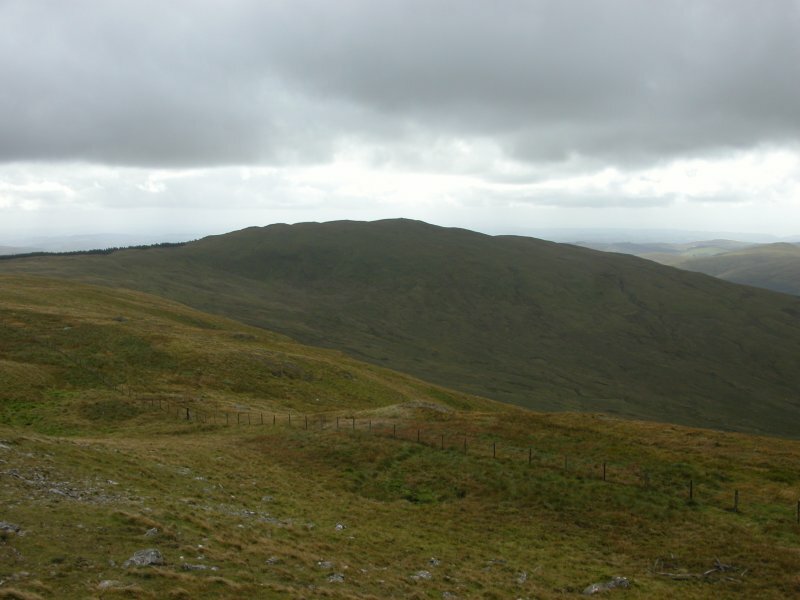 Banc y Celyn (472 metres) and Pant-y-llyn Hill (469 metres), some of the highest parts of the Mynydd Epynt range.